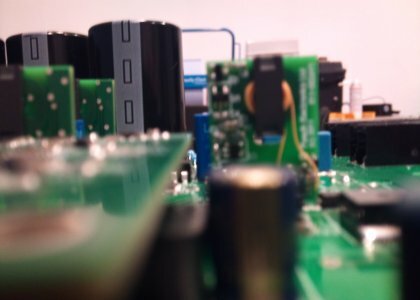 Fleadh Electronics Limited offers contract engineering and consultancy services, specialising mainly in the field of power electronics and motion control. The company's mission is to exploit advances in power semiconductor switching devices, power electronic circuit topologies, brushless electric motor technology and digital control to improve the environment and the greater good. This can be achieved by developing greener power conversion technology and energy sources, and improving the energy efficiency of electronic power supplies and motor drives in all manner of consumer and industrial products. Fleadh can undertake a feasibility study into the practicalities of your requirements, highlighting the most suitable technologies for realising your design as product at the right performance and cost. Prototype design and construction of novel systems for static power conversion and electric motor drives. Embedded software development on platforms ranging from low-end microcontrollers to DSPs and FPGAs, with the emphasis on introducing intelligent digital control techniques to power electronic systems. Bespoke software for simulating and designing motor drives, power converters and digital control systems. Expert advice in intellectual property, meeting international standards and the trends in commercial product development and academic research in power electronics and motor drives. This website also offers information and useful links to areas of power electronics. The publications section has links to free downloadable papers, patents and non-commercial reports by the company. There is also a section with a detailed listing of journals & magazines of interest to the power electronics and motor drives community, a conference listing archive and a web resources list of patent offices with links to searchable databases.